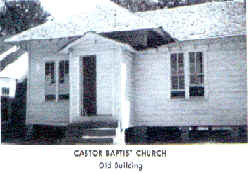 Castor Baptist Church had its beginning in the form of a Sunday School, which was directed and nursed through the period of the War Between the States by Major Henry (M.H.) Stanly, Sr. This Christian layman was a member of the Home Guard of the Confederate States of America. The effectiveness of the Sunday School is demonstrated by the events which followed. It prepared the spirit of the people of the community for a more important effort, the organization of Castor Baptist Church in 1868. The building at that time was a small log house with a mud chimney at one end that had been used for Sunday School during the War and as a general meeting place. In 1875 a second log house was erected. Its location was a few hundred feet southwest of the present building. The date was established during a conversation which took place in 1946 with Mrs. Kate Cavanaugh, one of the oldest members of the church at that time. She told of riding by on horseback going to Hot Wells when she was 17 years old and of seeing the men building the new church house. In 1890 the first "sawed lumber" house was constructed. When the people of the community started talking about building a bigger and better church house, Bill Smart (affectionately known as "Uncle Billy" offered to donate sufficient heart pine lumber to construct the building if the church membership ;would pay for the bare cost of cutting. This generous offer was accepted, and the lumber was cut on Uncle Billy's water powered saw mill. A Mr. Bagget was the chief carpenter, and M.H. Stanly,Sr., was chairman of the building committee. The building was a simple box house located a few yards south of the present building. Though it was rough, it showed a definite trend toward a better church building. During the construction Mr. Stanly said, "Well, we do this, and then when we get more, we will enlarge it." Later when the money was available, lathing and siding were added to increase the beauty of the building.In 1904 an extension of twelve feet was added to the west end of the building to furnish the additional space needed to accommodate the growing membership. During the winter of 1920-1921, a great improvement was made by an addition to the south side of the building, more that doubling the floor space and furnished enough area for three Sunday School rooms. A highlight of the summer of 1920 was a special Sunday that was set aside as Subscription Day. On that day pledges were made to the building fund, ranging from $10.00 to $100.00. In 1945 another small addition was made to the southwest corner of the building, serving to complete the rectangle of the auditorium and to supply space for another Sunday School room. In 1952 a new cinder block building was erected and the old building removed. John Reese Smart, Jr. and Calvin Jones made generous donations of labor and talent during this building program. In 1967 this building was improved by veneering the front with brick and making necessary changes to enhance the beauty of the place of worship. Then in 1968 the spacious fellowship hall was constructed and has proven useful and adequate until this day. 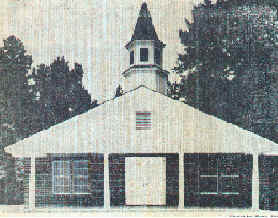 The church was air conditioned in 1969. Sunday, June 13, 1971, at approximately 12:30 a.m. it was discovered that the main building was on fire. Pastor B. G. Dyess and the church members had just finished the annual Vacation Bible School. Many projects were completed by the VBS students and workers in preparation for the closing ceremonies which would be held on Sunday night, June 13th. As the alarm went out, many community members rushed to the church to try to help save it. By the time the Leesville Fire Department arrived the fire in the Sanctuary Building was completely out of control. The firemen and community members concentrated on saving the Fellowship Hall and its contents. The fire department used 500 gallon of water (that's all they had) to save the Fellowship Hall as community members moved everything possible out of it. The fire bent the spirit of the church, but not for long. Very early the next morning church members were sweeping water out of the Fellowship Hall and preparing it for the 10 a.m. church service. Because of the spiritual guidance of Rev. 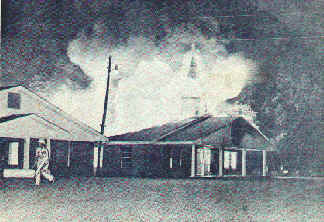 B. G. Dyess the church grew stronger in the wake of this disaster. After due and very prayerful consideration led by Rev. 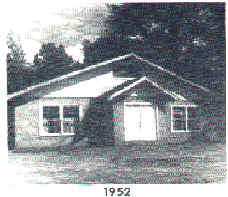 Dyess, the church decided to build educational rooms onto the back of the Fellowship Hall and to build a new Sanctuary Building. Construction for the new building started in the Fall/Winter, 1971. The new building was completed in the Spring of 1972. 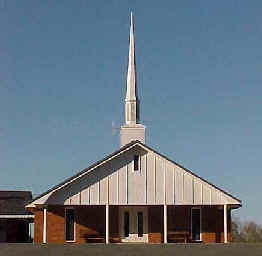 The Fellowship Hall had been used as the Sanctuary during the completion of the new building. Mr. Bert and Mrs. Mable Bray donated a new organ to the Church for the new Sanctuary. Dedication of the new Sanctuary was November 30, 1972. Everyone was invited to come and bring a basket lunch for fellowship. A third building was added in 1973. It contains a sizable assembly room, pastor's study, small church office, a room for literature and supplies, two rest rooms and six spacious classrooms. It was carpeted throughout and comfortably furnished. The church has been in continuous operation since that time.